Wild: One of the smallest predators on the island, Compognathus Curiosicarius can be seen as a pet, a pest or a threat. While alone, Compsognathus is not dangerous or aggressive. In larger packs, however, it remembers its carnivorous nature. After a group of Compsognathus grows to a certain size, their pack mentality always seems to embolden them to “attack”. Domesticated: Compsognathus’s can be tamed quite easily, so some tribes keep them for little more than friendly companionship. 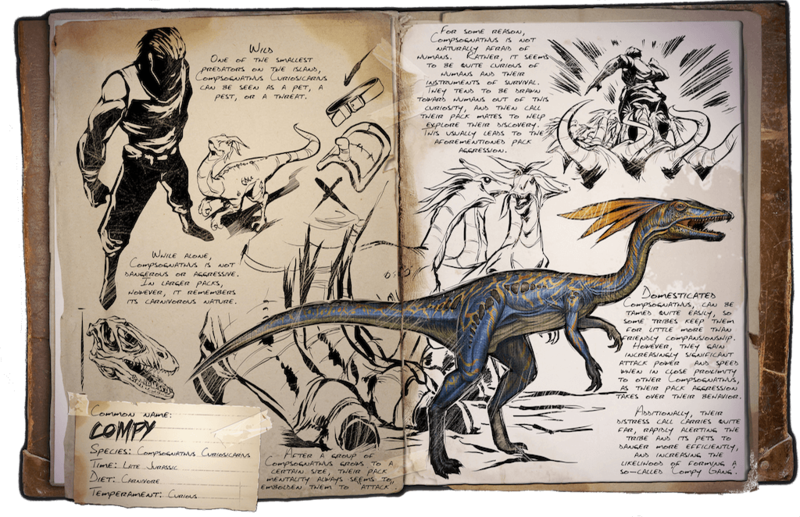 However they gain increasing significant attack power and speed when close proximity to other Compsognathus, as their pack aggression takes over their behavior. Additionally their distress call carries quite far, rapidly alerting the tribe and its pets to danger more efficiently, and increasing the likelihood of forming a so called ‘Compy Gang’.